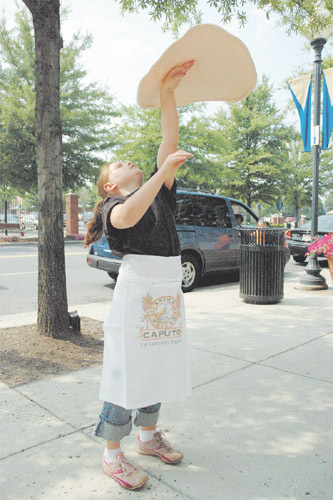 Juliana Zarou, 8, practices throwing dough in front of Don Corleone's Brick Oven Pizzeria is Sterling. Juliana Zarou uses her hands to do many things. She plays the piano, turns the pages of her favorite books and tosses pizza dough in front of her father’s restaurant, Don Corleone’s Brick Oven Pizzeria in Sterling. At 3:30 p.m. Thursday, July 20, Amy Zarou pulled up to the family restaurant. Three small girls spilled out of the green van, dressed in black shirts, white aprons and red caputos, Don Corleone’s signature bakers hats. Waleed Zarou met his wife and daughters at the door. He handed his oldest daughter, Juliana, a piece of practice dough made of rubber and sprinkled with flour, called Throw Dough. Juliana tossed the dough toward the sky, twirling the rubber on her fingertips and bouncing it off of the back of her palms. “The longest I’ve gone is 30 seconds,” Juliana said. She never took her eyes off the dough. 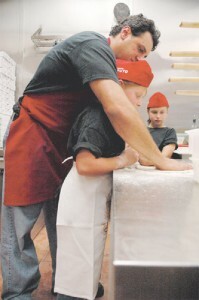 TWO MONTHS AGO, Juliana began practicing her skills in front of the pizzeria, in preparation for the Throw Dough National Finals Junior Division for the under 18 division in Orlando, Fla.
“She has a natural knack,” her mother, Amy Zarou, said. “My dad taught me,” Juliana said. Waleed Zarou began throwing dough when he was 13 years old. “I grew up around this my whole life,” he said. Juliana Zarou, 8, plays catch with her father, Don Corleone's owner, Waleed Zarou. Waleed Zarou found out about the competition through an industry magazine and from watching the U.S. Pizza Team throw dough on ESPN. In three weeks, Waleed Zarou is taking the whole family to Orlando, Fla., to watch Juliana compete against other children from across the country. She will be judged on the difficulty of her tosses, control of the Throw Dough and creativity. Right now she is working on tossing dough from one hand to another while spinning it, blindfolded. “The blindfold should get her big points,” Waleed Zarou said. Don Corleone's Brick Oven Pizzeria owner Waleed Zarou helps his daughter, Juliana Zarou, prepare dinner Thursday. If she wins the national competition, she will advance as the first female U.S. Throw Dough champion to compete against other throw dough champions from around the world. She is also working on “the whip,” when she tosses it in the air, catches it, brings the dough down to her bellybutton and makes a figure eight, rolling the dough over the palms of her hands and back to her fingertips. “It’s part of my routine,” Juliana said. She will perform her tricks to the song “Never Give Up,” and will sport a black T-shirt with her name and the Don Corleone’s logo and Web site on it. “In case she gets on television,” her father joked. Juliana spends her afternoons outside of her father’s pizza restaurant, tossing dough back and forth, up toward the trees and back to her fingertips. Sometimes, her father practices with her. Juliana’s main goal is to have fun. If she wins, she will receive a free trip to next year’s competition and a trip to Italy. Her father is excited about the possibility of Juliana being the first female U.S. Throw Dough champion. Portabella mushrooms, Kalamata olives, sweet Italian sausage, fresh mozzarella – is your mouth watering yet? If so, there’s a new restaurant in town that is sure to please the pizza connoisseur. Don Corleone’s Brick Oven Pizzeria in Cascades, owned by Waleed Zarou, prepares a gourmet pie combining the best styles from New York and Naples, Italy. “This all came about here by seeing that there really aren’t any high quality authentic pizzerias in Loudoun and seeing the need,” said Zarou. Zarou explained that many pizzerias bill themselves as “brick oven.” They may have an oven that is made of brick – but aren’t truly using the authentic method, he said. Don Corleone’s uses natural wood as fuel — not gas – and bakes its pies at a temperature around 850 degrees. These steps are necessary to achieve true Neapolitan pizza, according to Zarou. A little history: Pizza probably originated as long ago as ancient Egypt, but in more modern times, it developed in Naples. In the 19th century, Queen Margherita of Italy brought fame to the dish when she summoned the most popular of the Neapolitan pizza chefs, Chef Raffaele Esposito, to her court for a taste test. Esposito named the Queen’s favorite pizza, one with mozzarella, basil and tomatoes, Pizza Margherita. It’s a name that is still used today. True Neapolitan pizza uses the freshest ingredients, but not too many toppings. Since Americans tend to like to pile on the mushrooms, pepperoni and anchovies, Zarou decided to compromise. He studied famous New York pizza parlors like Grimaldi’s and Lombardi’s. “We feel our pie is right down the middle between the best of New York style and the best of Neopolitan style,” said Zarou. The traditional Neopolitan pizza is available at Don Corleone’s, however. It’s made with crushed plum tomatoes, fresh buffalo mozzarella, fresh basil and olive oil. The mozzarella is made from an bison common in Italy and has a sharper flavor than the mozzarella Americans are used to. Don Corleone’s sells pizza by the slice, individual pies (10-12 inches) and family pies (18-20 inches). It also sells salads, calzones, New York cheesecake and hand-stuffed canolis. Almost all the ingredients are imported from Italy to ensure top quality. So far, business couldn’t be better. “We’ve been open just barely five weeks and without putting a sign on the door … we’ve been rushed ever since,” said Zarou. The name “Don Corleone’s” is the family name of the mob family in Frances Ford Coppola’s Oscar-winning movie, “The Godfather,” and the restaurant is decorated with posters from the film. The motto, “We offer a pizza you can’t refuse,” is straight out of a mob boss’s phrase book. Seating is limited to a small counter inside and some outdoor tables, but Zarou said he hopes to expand someday with a traditional dining room with red and white checkered tablecloths. Though they don’t deliver to your home, Zarou is in the market right now for a 1940 classic mobster-mobile, for deliveries for special gatherings and corporate events. It already caters to AOL and the United States Postal Service. Don Corleone’s also sells a lot of the ingredients used in the pizzas to customers, such as balsamic vinegar, Italian olive oil and sea salt. Zarou is not a stranger to the business world in Loudoun. He also owns a hair salon called Farouk Systems USA in Dulles, which specializes in ammonia-free hair coloring. Both ventures tap into the growing market in Loudoun for top-of-the-line services – whether it be for hair care or gourmet pizza.